Sweet green peppers tend to get the shaft.They are often considered to play second fiddle to their older siblings, the bright red peppers that are the quintessential summer vegetable.But green peppers are a wonderful vegetable in their own right.In fact, green peppers are an essential ingredient in the “Holy Trinity” of vegetables (along with onions and celery) that form the basis for Cajun/Creole dishes.They are crisp and tangy with a just a slight bitter edge that gives them interest and depth.Not surprisingly, they are also quite healthful, being full of vitamins A, C, B6, fiber and many important carotenoids, while carrying a very low calorie and fat load. 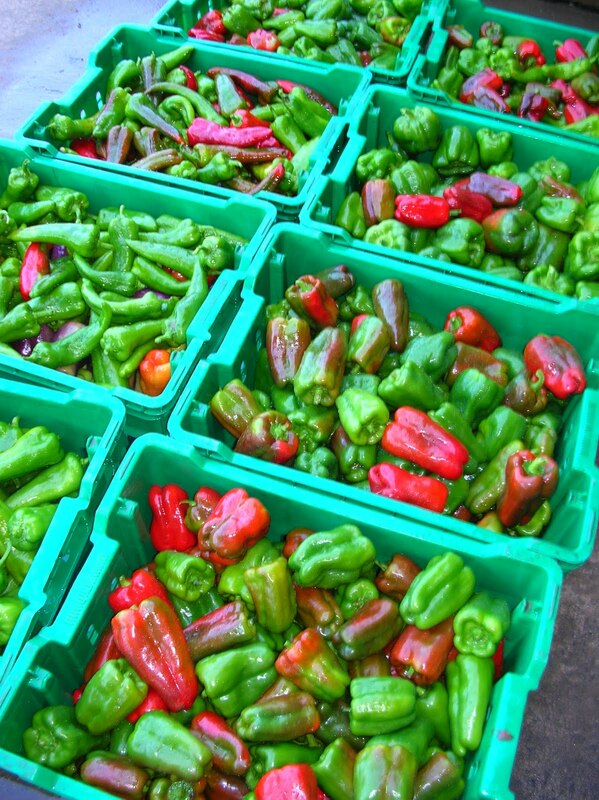 There are several varieties of sweet peppers, many of which are green earlier in their maturation.If left to grow for longer periods they will turn red, orange, or yellow.Some varieties stay green throughout the growing process. Green peppers also come in different shapes, the most familiar being the bell shaped sweet green pepper.But other varieties, like the Cubanelle type, can be long and slender. We are lucky enough to sample several varieties of sweet peppers at the farm, many of which are shades of green now, but which will start coming in red, orange or yellow as the season progresses.We will see the whitish Flamingo pepper which will eventually turn red; the lime colored Biscayne which will become a deep orange; the Ace bell pepper, the Purple Islander and Carmen Italian varieties that will all turn red; and another bell pepper variety that will eventually mature to yellow. But lest we sit back waiting for the rainbow and miss out on the pot of gold, here are some ideas for using up those sweet green peppers that are available now in the distribution. Sweet green peppers are great in salads or as a part of vegetable platter.They are also wonderful quick pickled where they keep their fresh, irresistible crunch. The list here is potentially endless…cooked in omelets or frittatas; roasted or grilled as part of a salad or side dish; roasted and pickled (see recipe below); stuffed and baked (see recipe below); baked in casseroles; cooked in soups/stews; featured in Cajun/Creole cooking (see recipe below); grilled on shish kabobs; or quickly stir-fried with your other favorite veggies or meat. Choose sweet green peppers that are smooth without wrinkles, bruises, or holes and whose stems appear green and fresh.Store peppers in plastic in the refrigerator, where they should last at least a week. There are endless uses for these super tasty pickled peppers.They are wonderful on top of grilled steak, pork or fish, as a condiment for tacos, or as a topper for crostini (with a thin slice of Manchego cheese).The recipe was highly adapted from Cooks.com. 1. Preheat oven to 400 degrees.Oil or spray a large rimmed baking sheet.Cut top and bottom ends of peppers and reserve for another purpose (they are great to snack on or to add to soups or salads).Make a cut lengthwise from top to bottom, then use a knife to go around the inside edges to remove the seeds and membranes.You will end up with a long strip of pepper.Place skin side up on one layer on pan.Spray or brush with oil.Bake for about 20-25 minutes, or until pepper is soft and skin is blistered.Remove from oven and place pieces in a plastic baggie.Seal and let sit for 15 minutes to loosen skins. 2. In a small skillet, heat cumin seeds on medium heat, stirring frequently, until fragrant and toasted, about 3 minutes.Remove from heat and allow to cool. 3. Place onion, vinegar, garlic cloves, bay leaf, oregano, salt and pepper in a small saucepan over medium heat.Bring to a boil.Reduce heat and simmer for 1 minute.Remove from heat.Add cooled cumin seeds and olive oil.Allow to cool while you peel the peppers. 4. Remove pepper pieces from bag and remove skins.Cut peppers into strips and place in a bowl.Pour vinegar mixture over peppers and carefully stir mixture, being careful not to break-up peppers but getting the vinegar and onion mixture to fully coat the pieces.Pour into a glass jar.Press down gently on solids to submerge as many of the peppers as possible in the vinegar.Allow to cool for one hour, then cover with a tight fitting lid and refrigerate.Use within 2 weeks. Shrimp Etoufee is a quintessential Cajun dish.It is delicious, but not difficult to make (the long ingredient list is deceiving as most of the ingredients are spices).This version is fairly mild.If you prefer at lot of heat, add more cayenne and hot sauce. 1. In a small bowl or with a mortar and pestle, mix paprika through kosher salt.Set aside. 2. In a large skillet, melt butter with olive oil on medium-low heat.Add flour and mix well to make a roux.Cook roux, stirring frequently, until roux turns a peanut butter brown, being careful not to burn the roux, about 7-10 minutes.Add bell pepper, celery and garlic, and cook, stirring occasionally, until vegetables are tender, about 7 minutes.Add tomatoes, bay leaf, clam juice, and seasoning mixture.Bring to boil and then reduce to a simmer.Cook, stirring occasionally, about 20 minutes, or until tomatoes break down. 3. Add shrimp and cook, stirring occasionally, until shrimp are opaque and cooked through, about 5-7 minutes.Season with additional salt and hot sauce, as desired. If mixture is too thick, add more clam juice or some broth. Quinoa makes a healthful and delicious substitute for ground meat in this Mexican style version of stuffed peppers.They are hearty enough for a meal but also make an interesting side dish.If your peppers are small, you might want to use 5 or 6. 1. Place broth in a medium saucepan and bring to a boil over medium heat.Reduce heat to low, stir in rinsed quinoa and cover.Cook for 15 minutes.Remove from heat and allow to sit for 10 minutes. 2. Preheat oven to 350.Line a lined baking sheet with foil and spray with cooking spray.Set aside. Place a steamer insert in a large pot filled with about 1″ water.Bring water to boil.Place pepper halves in steamer insert and steam, covered, until tender, about 8-10 minutes. Remove from steamer and place cut side up on baking sheet while preparing filling. (Peppers can also be boiled, if you don’t have a steamer insert). 3. Heat olive oil in a large skillet over medium-low heat.Add onions, garlic, and jalapeno, and cook, stirring occasionally, until vegetables are tender, about 8 minutes.Add cumin, chili powder, coriander, salt, and pepper, and stir for 1 minute.Add tomatoes and zucchini and cook, stirring occasionally, until tomatoes have broken down and zucchini is tender, about 10-15 minutes.Mixture should not be watery and sauce should have thickened considerably.Add corn and cook for 2-4 minutes, or until corn no longer tastes starchy.Remove from heat and add cooked quinoa and chopped cilantro.Mix well. 4. Fill pepper halves with quinoa mixture.Sprinkle evenly with cheese.Bake for 15 minutes, or until cheese is melted and quinoa mixture is hot.